We had a little excitement when I was in Dahlonega last week. Woodrow Parks reported that there was a shoplifter in the area. He says a fellow walked into his drygoods store and spent a lot of time in the lingerie section. When Woodrow tried to confront him, the man disappeared. Woodrow says the stranger just gave him the slip. So Woodrow noticed his stock was low and called the sheriff to report a theft. The sheriff came and asked him if he could provide the particulars. Woodrow said no, the stranger ran off with them. The sheriff said what he meant was: did he have a description? Woodrow told the sheriff he was pretty sure the stranger only took silk. So if you see this fellow, let the sheriff know. I can't help you if you missed the thief, but if you missed last week's show, you can view some pictures of it in my photograph album. The sheriff was nice enough to let me park my wagon across from Nix's store up in Dahlonega last night for a performance of the Mountain Music and Medicine Show, I think in part because he wanted to see the show himself. With groups like the the Hoyles, the Georgia Mudcats, the Skillet Lickers, Mist on the Mountain, and the Buzzard Mountain Boys, who can blame him? Young Etowah Adams and his sisters Sarah and Selu opened the show with several pieces they learned through the Dahlonega "Pick and Bow" program for young musicians. I wish more towns had this kind of program (I could supply my show more easily with talented young artistes)! Thanks to all the folks who work so hard to bring this show to town. Check back later this month to see more photos of the show. Hope to see y'all again in May! On rare occasions, my recommended cure for snoring does not work. I once knew a man who respirated in his sleep with such great vocality that he woke his family AND the neighbors, and no amount of Wizard Water© corkage seemed help. He came to me, very distraught. “Does it sound something like a whistle and a roar?” I asked. “So I am told.” he replied. The man took my advice. The last I heard, he was plying the Mississippi between Hannibal and New Orleans. The folks along the river occasionally complain about the loudness of the new “steam whistle,” but the captain is satisfied because other boats keep a wide berth. His family and neighbors are satisfied, too, because they get a full night’s sleep when he is home now, due to the fact that he has accustomed himself to working the day shift. I was once chased by a grizzly bear. 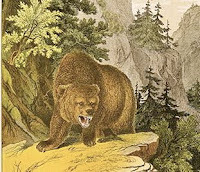 If you have never seen one of these creatures, all you need to know is this: grizzly bears are to regular bears what elephants are to dachsunds, but with more teeth. It happened late one night when I was taking a little-used back road, riding a horse I had borrowed from an associate. I was on my guard against surprises, otherwise I might not have noticed the snap of a tree branch behind me. I looked back, and at first wondered if the full moon had gone behind a cloud, because the trail behind me was pitch black where it had been bathed in moonlight only a moment before. Then I noticed a silhouette against the star-filled sky, and realized that I was looking at a living creature. It was a bear as big as a buffalo. To be perfectly accurate, it was as big as a buffalo standing on top of a courthouse. That might not have alarmed me, had the creature not also been headed in my direction. I am not one to panic. Calmly, I turned around and, with as little movement as possible, urged my horse to increase its speed. This it did, but not by enough, I soon learned. The sound of cracking limbs grew closer. I looked back and saw the bear just a few hundred yards away and closing fast. I spurred the horse forward. The horse, which must have gotten a whiff of the beast, leaped ahead with alacrity as if it had been slapped by lightning. Unfortunately, we were headed downhill, and this only helped the great creature. My steed jumped over boulders as tall as fence posts, but it did no good. The bear merely swatted them aside and continued to gain on us. He got so close that I could hear his grunts. I knew that I had but a few seconds before we were overtaken. Just then, I saw a low-hanging branch ahead. I resolved to grab that limb and take my chances in the tree it was attached to. With luck, the bear would not notice my absence and continue to pursue the horse. I hoped that, once lightened of its human load, the horse would lead him far away. We rode under the tree and I reached for the branch. Unfortunately, the bear dove for us at that very moment. The impact knocked me unconscious. When I awoke, I found myself still in the saddle, tangled in the reins and moving along at a good clip. I could not understand why I was still alive. Where was the bear? I looked around. No sign of him. The road entered an open area and in the full moonlight I saw the answer: the bear was beneath me. He was wearing the bridle and bit, and saddled just like the horse. While I lay unconscious and tied to the saddle, that bear must have eaten the horse from tail to nose, right under its harness and all its gear. Well I rode that grizzly down the mountain into the next town. Since it was so late and I did not wish to disturb anyone, I guided him into the livery stable myself and put him in an unoccupied stall. There, the satiated creature curled up and promptly fell asleep. When I was sure he was slumbering soundly I dismounted, borrowed another horse and quickly went on my way.